Honestly, we don’t eat a lot of meat. I I try to make sure vegetables and healthy whole grains are a bigger part of our diet than meat…mainly because I’m stinking’ cheap frugal. And high quality meat can get expensive! Before we jump right int here, remember if you don’t feel like making a Crock Pot Baked Chicken, you could easily pick up a rotisserie chicken and do the same thing. I won’t tell…unless I’m behind you at Sam’s. Then again, I won’t tell if you don’t tell that I have Apple Pie in my buggy. Deal? For our first meal, I cook the chicken. I pick off some of the white meat to serve and I leave the rest of the chicken to cool until I can pick it off. Things I might serve with baked chicken: veggies of all sorts, side salad, Glazed Carrots, rice, Roasted Green Beans, mashed potatoes, Vegetable Casserole or Macaroni and Cheese. 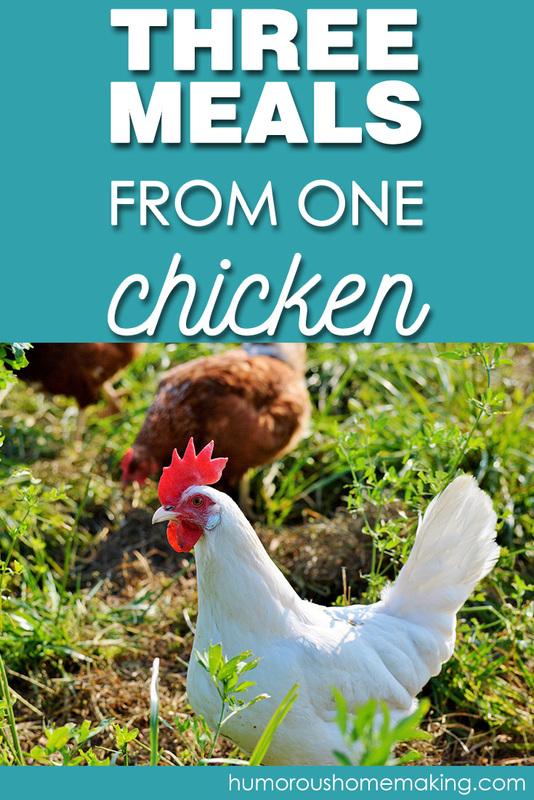 I can almost always come away with 2-3 cups chicken AFTER we eat. Like I said, meat isn’t our main attraction at dinner. Unless it’s bacon. Then look out. But save the bones in your fridge or freezer – we’ll need them for our third meal! I usually use some of the cooked chicken and make a casserole of some sort. Or maybe something noodley. I don’t always do this right away. A lot of times, I freeze my extra chicken in 1 cup portions for later. But for the sake of this post, let’s pretend like it’s tomorrow. Chicken three nights in a row wouldn’t be that terrible…but it ain’t bacon. Now, you could serve any one of those things with a side salad and/or some fruit. I prefer AND fruit…because, I like to eat. Okay, so here we are. Tired of chicken yet? This time, we’re making soup! I can use the bones from the whole chicken and make a batch of chicken stock. Now we can use that lovely chicken stock we made and the remainder of the chicken. It’s okay if it’s dark meat. No one will notice in the soup. My sister is a weirdo and likes dark meat. 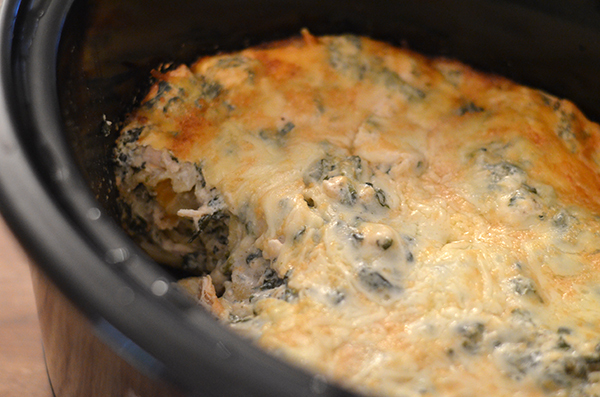 I do not like dark chicken meat…but I can eat it just fine in a soup or casserole. Since she likes Apple Pie, I decided to keep her around. 😉 My sister, not the chicken. So, there you have it! 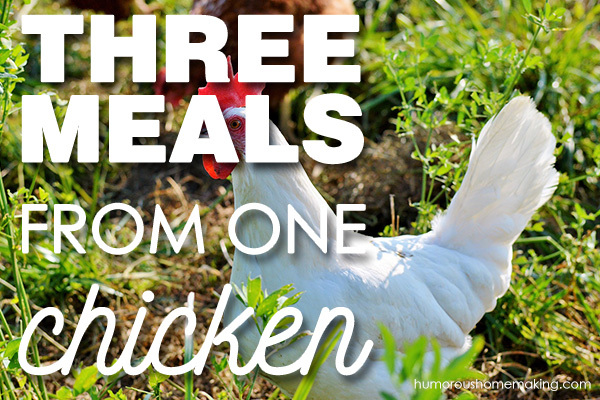 Three meals from one chicken! Unless you’re feeding teenagers…and then, I got nothin’ for ya. I’ll be there before I know it. Scary. Hold me. Best food blog I have read ever! Thanks! I enjoy the humor! Keep up the good work! Yes! I love doing this. My friends laugh at me (or they did, until they tried it). When chickens are on sale I roast a couple at a time, peel the meat and voila . . .A LOT of dinner options! I freeze the cooked meat and use it later in EVERYTHING and then use the bones for stock 🙂 Yummy and frugal! And it’s really so easy, isn’t it!? So I think we’d almost be in the “1 chicken per person” category! Ahhh! I feed 4 adults and 5 boys. Oh and I absolutely hate getting chicken off a bone. I’m really trying though! What is the deliciousness in the crock pot pictured above? The stuff with what looks like spinach? Put me right along side your sister because I like dark meat too. LOL Great ideas. Roasting a chicken right now so perfect timing for me. We have a 3 day meal too! Ours starts with a good ol’ pot of beans. We use pinto beans and a ham hock, or bacon grease, throw in an onion or what ever suits my fancy. I serve cast iron skillet cornbread and sometimes fried potatoes. Day 2 Chili and cinnamon roll. To the left over beans I add ground whatever (usually beef) and typical chili stuff. The cinnamon rolls MUST be homemade or the kids complain. Day 3, if there is anything left over, enchiladas! Now that the kids are all bigger than I am and eat twice as much, day 3 is sometimes a no go. Anyway, I add more beef if needed, another onion, maybe some refrieds. enchilada seasonings and sauce……. Roll the stuff up in tortillas with some cheese, pour any left over the top and bake. Sometimes I add a can of sauce to the top to keep them from getting too hard. If I start out with a big enough pot of beans and put some aside before the chili, I can get two big pans of enchiladas and put one in the freezer for a 4th meal! I serve salad with the enchiladas, and/or a veggie. GREAT plan!!! Thanks so much for sharing, Brenda! I use this through out the year, but the week of Thanksgiving…… OOHHHH BOY, does it help. About 4 years ago I figured it out, if I use the 3 day meal that week I don’t have to think too much. Monday = beans, Tuesday = chili and cinnamon roll, Wednesday = enchiladas or left over chili. This lets me think about the important, almost all consuming THRUSDAY! By the way, not only are all 4 of mine bigger than I am, three are teenagers, one is 22 and I have an extra one that’s 22 as well. So I guess I have 5 teenagers to feed. What a fabulous article! I love what you said that you don’t eat a lot of meat, but you eat meat a lot. 🙂 Thank you for all of these great tips and recipes! Well, I’m glad it made sense. After I said it, I wondered if anyone would get it. Ha ha! 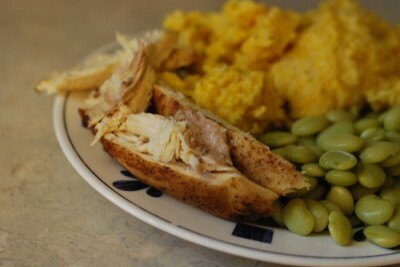 Chicken is the best, and I LOVE making it in the crock pot! It’s so versatile and can go into so many recipes. As far as teenagers go, I’m not there YET, but I will be soon. My eldest turns 10 today!! A decade has FLOWN by. Hi Stacy what size chicken do you typically buy? Just a regular ole fryer. I think they normally run around 5 pounds? Hi Stacy! I love your blog, I just found you about 2 months ago. I’m curious what size chicken you buy. And I’m trying to get my husband to buy the magnesium lotion…5 years no sleep. He’s a skeptic! Won’t know until ya try it… Hope he agrees to try! I just buy a fryer chicken. I think they normally run around 5 pounds. Just big enough that it isn’t too big for my crock pot. 🙂 If that makes sense.